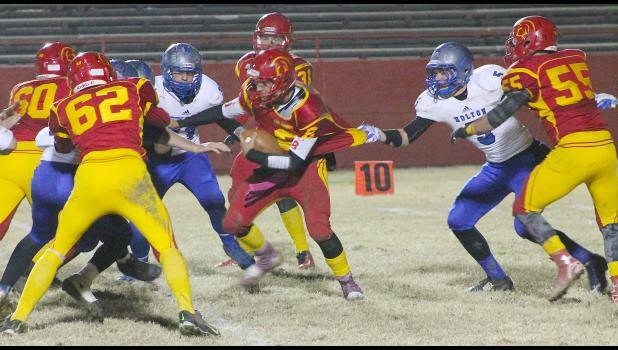 Football, as has been stated an immeasurable number of times, is a game of inches and that very much proved to be the case in Holton’s sectional showdown in Columbus on Friday. 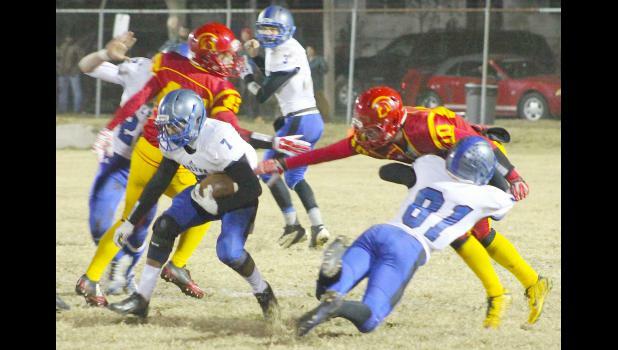 Holding a six-point lead with a little over 13 seconds left in the game, the Wildcat defense forced the Titans into a critical fourth and goal situation from the four-yard line. 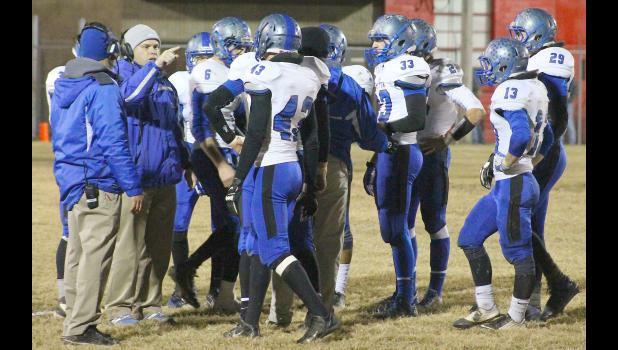 Despite being worn down on that final drive, Holton had a chance to make one final stop that would be the difference between a sub-state berth and an early end to the season. The outcome of the game hinged on one play and it was pretty clear what was going to happen. The Titans were going to give the ball to star running back Jace McDown, who finished the game with 113 yards on 25 carries (they did) and the Wildcats were going to load the box and bring the blitz to stop it. Holton did just that, only the defense wasn’t quite able to stop McDown. HHS linebacker Mason Barta had his legs wrapped up, but the Titan running back extended for those precious final inches that proved to be the difference in a 22-21 victory for Columbus. Two of the biggest penalties of the seven total called on Holton (compared to two for Columbus) came on the possession prior to the Titans’ game-winning drive as the Wildcat offense marched inside the red zone before two big penalties backed them up and they ultimately ended up a yard and a half short of a first and goal situation. “I don’t think there’s any way they were going to stop us if we have to get 10 yards in four plays down there,” Barta said. Prior to that, the Wildcats were able to create the only turnover of the game as linebacker Jordan Booth came up with an interception to end a Columbus drive that crossed into the red zone. While Barta said turnovers would be a key factor in the game, Holton again couldn’t take advantage and left the door open for the Titans. From the start of the game, Holton looked to be in control offensively as the linemen opened up big holes and the running backs piled up the yards (amounting to 364 in total). The Wildcats picked up two first downs in the first three plays and went on to grind out two scoring drives on their first two possessions, with Indie Allen and Trey Tanking punching it in on short touchdown runs to put HHS up 14-0. Columbus scored on a five-yard touchdown run by fullback Taylor Watkins after that to make it 14-7, but Holton was driving and threatening again towards the end of the first half. After a big third down run by Tanking, the Wildcats were back in Titan territory, but a facemask penalty killed that final drive before the Wildcat defense held to maintain the 14-7 lead at the break. At halftime, Barta said he talked to his team about continuing to push the pace on offense since the Wildcats felt they should’ve been up by two scores at the break. He noted his team would need to be wary of the Titans coming out and controlling the ball in the second half as they went into the locker room amped up. Sure enough, Columbus came out and did what it had done in the first half, converting some fourth downs to keep its opening drive going before Watkins delivered with a 37-yard touchdown run. The Titans then went for two and got it to take a 15-14 lead. That lead was short-lived as Luis Butto then answered for the Wildcats on the first play of their next offensive possession. Butto added to his strong rebound effort (after sitting out against Osawatomie) with a 65-yard touchdown run, part of his 145-yard rushing performance on the night, to help Holton regain the lead, 21-15. While the Holton defense was able to make some stops after that, the Titans continued to do what they had done all night as the offense managed to grind out just enough on the ground (202 rushing yards) and took some chances that seemed to be rewarded more often than not. The game played out almost exactly the way Barta predicted, but the Wildcats couldn’t quite put the Titans away and their miscues (along with the Titans’ gambles) led to the ultimate pay off for Columbus as it secured the sectional victory and a spot in the Class 4A-DII sub-state round. For Holton, the loss brings an end to season that was quite a journey. Having to plug in so many new starters and deal with several injuries along the way, Barta said this group of Wildcats handled it all in stride. While the loss is disappointing, Barta noted the season ends that way for 31 out of 32 teams in Class 4A-DII, but he said that doesn’t make the season any less of a success for this squad. 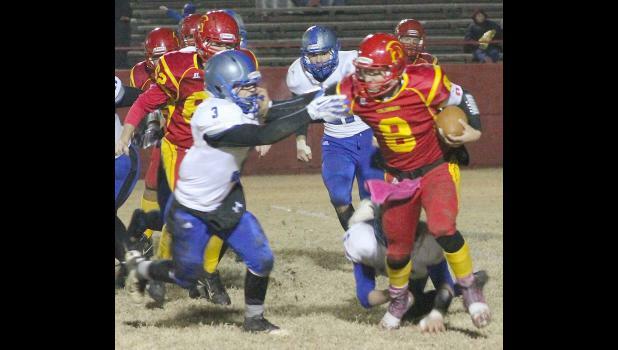 The Wildcats ended up one win shy of a third consecutive sub-state berth and he said the players found a way to become a good football team. Holton finishes the year 9-2 overall. HHS: 52 plays, 364 total yards, zero turnovers and seven penalties for 55 yards. CHS: 54 plays, 275 total yards, one turnover and two penalties for 15 yards. Rushing: HHS- Butto (14-145-1 TD), Tanking (9-67-1 TD), Allen (11-64-1 TD), Lovvorn (8-35), Barta (4-36), Rieschick (6-17); CHS- McDown (25-113-1 TD), Watkins (6-52-2 TDs), Bole (10-28), Morrill (3-9). Passing: HHS- Tanking (0-2-0); CHS- Bole (7-10-73-1 INT). Receiving: CHS- Morrill (2-31), Watkins (2-27), McDown (1-8), Roark (1-4), Stanley (1-3). Defense: HHS- Booth (13 tackles, INT), I. Allen (11 tackles, 1 TFL), C. Allen (10 tackles, sack), Barta (11 tackles), Lovvorn (8 tackles, 1 TFL), Brandt (7 tackles), Rieschick (7 tackles), Frakes (5 tackles).